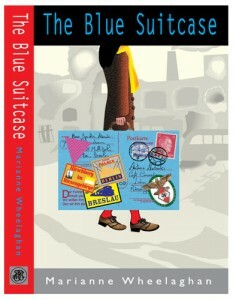 Marianne Wheelaghan’s first novel was a semi biography of her mother’s life, inspired by letters found in an old Blue Suitcase when she died. Not that it detracts from the book in any way, but books like this are sometimes written for therapy and you wonder whether the author has it in her to write a professional novel without the personal emotional stimulus. So when Food of Ghosts landed on the desk, I was curious to find out. 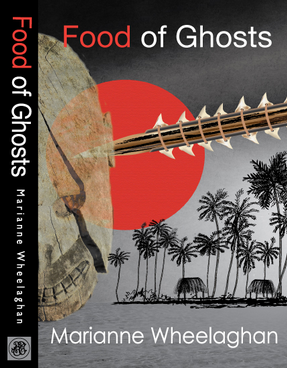 Food of Ghosts is crime fiction but Marianne has resisted the temptation to join the developing Tartan Noir set and not located her heroes and heroines in the City of Edinburgh, which she herself lives, but where they are in danger of being upstaged by the setting itself: she has set her story on Tarawa. Fortunately, a simple geography lesson, map and history are presented at the start of the book, or my first task would have been to get out the Atlas. 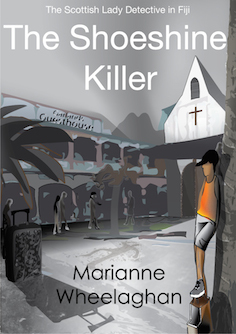 With her husband, Marc, a science teacher, Marianne spent five years teaching, writing and volunteering on this ‘paradise’ coral atoll in the Pacific Ocean and her familiarity with the island itself and the lifestyle of the Kiribati people creates a wholly believable setting; not Edinburgh, but quite fascinating. The heroine is Detective Sergeant Louisa Townsend, herself originally from the island but uprooted and brought to Edinburgh at the age of eight. She has had a British education and is used to British standards in all things, such as flushing toilets, mobile phones, internet access and a stiff upper lip. But thanks to her childhood and the familiarity on the island of her (very) extended family, she knows it is possible to live without flushing toilets, mobile phones and internet access. The presence of a significant ex-pat community means she has access to stiff upper lips when required. Indeed it is one of these ex-pats who is murdered and it is Louisa’s job to find out why and by whom and whether there is any connection to a previous and/or a subsequent murder. The police investigators programme Louisa is working on is based on a programme carried out here in the UK for new officers and the idea for Food of Ghosts was sparked off by an accident that occurred while Marianne was living there. I had a few goes at pinpointing the murderer(s) and failed, although I got close nearer the end, so that was fun. When you plan to write a series of novels, you have to be confident that you have a strong, interesting and likeable enough lead character and Detective Sergeant Louisa is certainly that. If her toughness comes from her early cultural upheaval, her father walking out and from having had to suffer racist remarks whilst growing up in Edinburgh, these factors have also provided her with a weakness: obsessive compulsive disorder. It is an area that inspired Robert Louis Stevenson, an area that even the most well-travelled of us will probably never see, but an area that I suspect I will grow to love and care about, through the eyes of Detective Sergeant Louisa. The Blue Suitcase was not a one-off. Food of Ghosts has created an appetite for more.